I hope you are enjoying the lazy days of summer! If you are looking for STEM activities, here are a few I wanted to spotlight this month. Girl Scouts just announced 30 new badges for the 2018-2019 Troop Year. Girls (K-12) can learn important life and leadership skills in cybersecurity, environmental advocacy, mechanical engineering, and robotics. There’s even a NASA-backed space exploration badge! 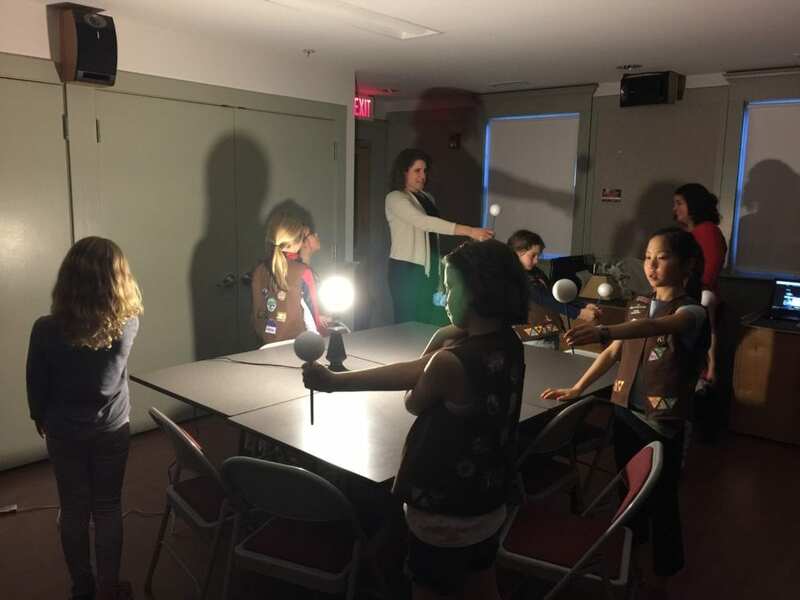 Join or renew your child’s Girl Scouts of Eastern Massachusetts membership for the new Troop Year, which starts in the fall. Be a participant in a scientific study! The Social Learning Lab at Boston University is a research lab dedicated to learning about how children develop and acquire knowledge from their social interactions with others. They are searching for the answers to questions like: “How do children decide that someone is an expert?”, “How is parent teaching style related to student learning style?”, “How do families talk about scientific phenomena, like germs?”. The studies involve short science games for the child, some free play time between parent and the child, and are always a lot of fun. This is a wonderful way to contribute to scientific research, meet scientists, and see a real lab at work! Learn more. August (multiple dates): Microsoft Stores in Boston, Burlington and Natick are offering a variety of FREE STEM summer camps for students ages 8+. Register now. August 3: Free Friday night admission to The Discovery Museum in Acton. August 11: Come watch student teams compete at the Massachusetts World Robot Olympiad™ Qualifier at the Woburn Boys and Girls Club and meet STEM exhibitors. Free event + open to the public. August 15: Participate in a webinar by KTBYTE discussing the benefits of learning Computer Science early and how students are able to use this knowledge as a stepping stone to excel in different areas. August 16, 23, 30: Attend a KTBYTE open house in Lexington or Newton, where prospective students can participate in a free trial class about computer science. August 30: Opportunity for enterprising local students to pitch their businesses at Venture Café Kendall Youth Night in Cambridge. FREE event. Apply now!